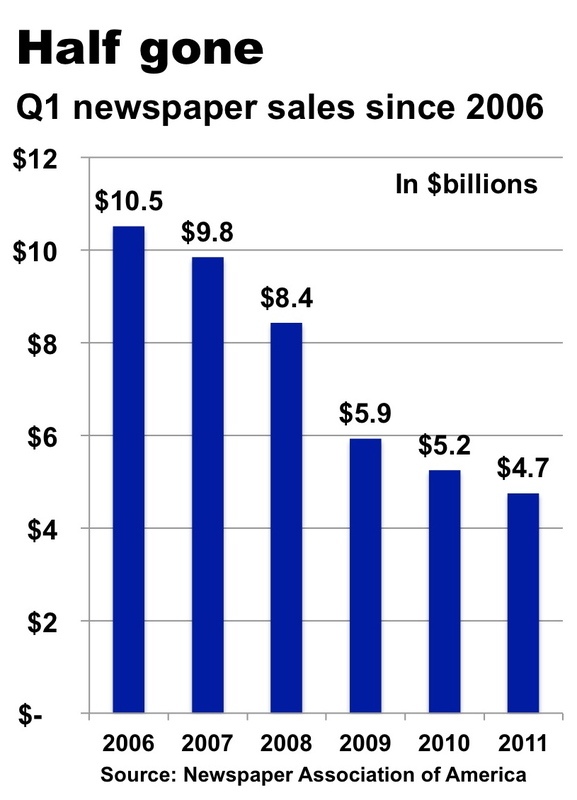 Interesting to compare what you heard at the confab, Alan, with the new Pew study of how newspapers are -- or aren't -- confronting the revenue problem. The Pew study is deeply researched and quite depressing, except that it found evidence of a few bold and savvy operators beating the odds. You report your findings in a commendably neutral fashion. But what's your opinion: Were you talking to the bold and the savvy or the wishfully thinking? As I noted in another post, in addition to the onslaught of digital media, newspapers are suffering from poor customer service. A couple of months ago I contacted newspaper senior ad executives in the top 50 US markets to get rates for a client who was interested in advertising in many of them. To date, newspapers in 20 of those markets still haven't replied to numerous emails and telephone queries. Reminds me of the old days at The New York Times (before I got there in 1989) when no one answered the phone in the Ad Department after 3 pm because they'd sold out the advertising inventory. If I were a publisher today I'd hire someone to try to reach my sales staff and see if he or she could place an ad or get information. And I'd also hire someone to try to buy a subscription. It took me about nine weeks to get one from the LA Times! ... while it appears daily newspaper advertising revenues may be leveling off at less than 1/2 their "peak" the next major blow will be to their insert revenue; which is HUGE in their Sunday papers... and it contributes an 80% profit margin...if insert revenues fall off at the rate of classified then a lot more daily newspapers will be circling the drain...or going 3 days a week at best.. and their are several internet companies trying to do just that: Take away Sunday newspaper insert revenue... a honey pot of profits!!! I am 32 years old. Me and most of my friends read the paper now. The paper paper- the FT and the NYT. When I am back home, I buy the local rag too. Of course the apps too. Granted, I am in a somewhat special case, having a job that pays more than the average, but one thing has dawned on me in the last 5 years- paying for news is worth it. I honestly don't have the time to fish around for free news on the net and I really dont care for the AP wire on Google News or Yahoo Finance. Internet news is frankly crap. I go to it for TMZ, Tech stuff and sometimes ESPN. I suppose I am a minority who pays, but was it ever above 50 percent in the last 40 years? 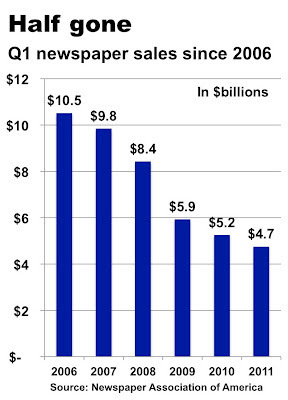 Interesting the note about the earlier rebound of other advertising media after the 'great recession'. It's worth noting that advertisers were jumping for the low hanging fruit at that point and were trying to stretch their ad dollars. At the paper where I work, we saw lots of advertisers jumping to do experiential and promotional sampling with a minimum ad buy vs. that huge full page colour piece they normally bought. The dollars are still there, you just have to present your clients with options that make sense given the times. This is when you're going to see the silos that have built up around lazy ad sales departments start to come down as they begin to rely on other departments to provide the value to their clients.